At the Donaumarkt on Saturday we spotted fresh baby spinach for sale. We didn’t know quite what was going to happen with it, but we knew it’s not there all the time and the odds were not good we’d see in there again in a couple weeks at our next opportunity for locally-sourced produce. So we snapped up a kilogram and tried to think up some tasty plans for it. We figured out pretty quickly that all we’d need to purchase additionally was a block or two of feta and some phyllo dough to turn it into Spanakopita. We liked the looks of this filling, but adapted it for what we had on hand (fewer onions, more shallots, skip the leeks, more spices, etc.). The layers upon layers of fragile phyllo dough, brushed with butter, painstakingly arranged in the baking pan, sounded like more work than we wanted. Fortunately, there was a blob of pie crust dough in the freezer. 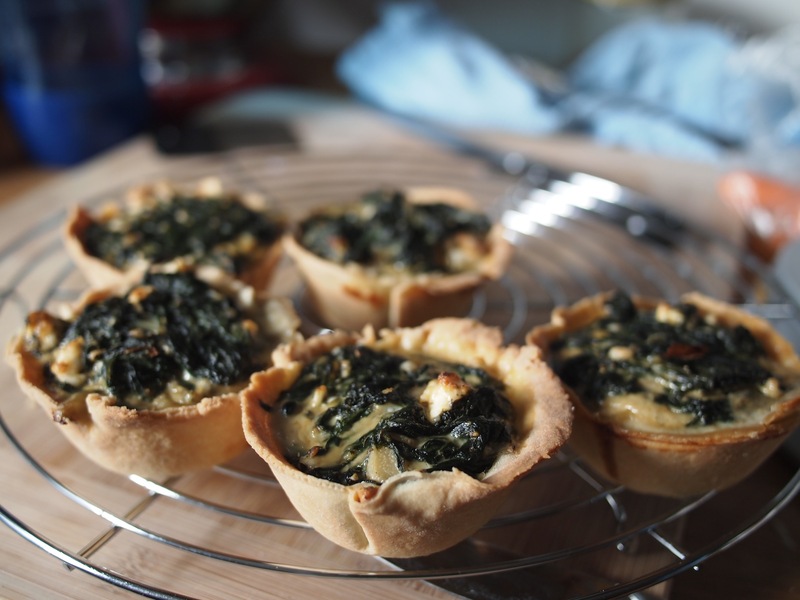 Hey — what about making them as single-serving quiches? Some quick googling confirmed that others had had good results baking spinach pies in cupcake tins. We used this recipe as inspiration for baking time and temperature, but really want to try her filling next, too (spinach + chickpeas + curry = YUM). Heat oil to medium in a deep skillet. Add butter to oil until just melted (don’t let the milk solids burn), then add onion, shallot and garlic. Cook until just tender and translucent, then start adding the spinach by handfuls. Gently fold in each handful of spinach until wilted and bright green, then add the next. When all spinach is wilted, remove skillet from heat and pour spinach mixture into a colander. Gently press the spinach to remove as much moisture as possible. Let stand and cool for about 10 minutes. When spinach is cooled, transfer to large bowl and add eggs, feta, pepper, dill, allspice and cayenne. Stir until well mixed. Set aside and start working with the pie dough. Start with one ball Pâte Brisée pie crust, fresh or thawed. Tear off a ping-pong ball-sized lump and roll that out thinly onto a well-floured work surface. When you can just barely start to see through the rolled-out dough, that’s thin enough. A little thicker is OK too — makes for sturdy quiches. Using a small bowl as a guide and a butter knife, roughly trim the dough into four-inch (10 cm) circles. It doesn’t have to be perfect; wide enough to fill a cupcake tin is enough. Save the trimmings to reincorporate into the next one, and make as many as you can. Tuck the dough circles down into a lightly greased cupcake pan. Fill the crusts all the way up with the spinach filling (they’re going to shrink and firm up a bit while baking, not expand, so go large). We got 9 cupcake-sized individual quiches out of one batch of crust dough. Bake for 25 minutes. They’re done when the visible parts of the crust has browned lightly and the blobs of feta in the filling are oozy. They’ll cool faster if you take them out of the pan — they should pop out easily with a little prying. Oh, does this look good! And easy enough that I might actually make it – many thanks for sharing!